Is (more or less planned) emergency overnighting with usage of hammock and/or canvas tent considered wild camping in Europe (especially in Germany)? In many countries, such as Germany, wild camping is disallowed and fined, but if you don't use full tent, but only canvas to protect yourself from rain/insects, is it still in praxis treated the same and fined? Anyone under a tarp - a waterproof tarp stretched - stayed overnight, camping out and is in a legal gray zone. 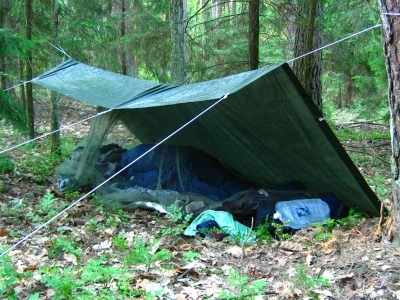 The night under the tarp also reduces the risk of being discovered and provides maximum enjoyment of nature, as it falls asleep and wakes up with green view. I have stealth camped all over Germany (and rest of Europe) for many years now and never had any problem. But you have to be discreet. I always take care that nobody sees me, meaning you set up camp when it gets dark and leave early. With my limited knowledge of German, I would personally consider other alternatives first. An altercation with a local with whom you cannot communicate with is not something I would look forward to. "kampieren" is the thing that in most German Länder is not allowed in the forest (with some exceptions: Brandenburg, Mecklenburg-Vorpommern, Schleswig-Holstein). AFAIK it is defined by a list of "housings" that start with a tent as the "smallest version" (followed by caravans, cars, mobile homes). Tarps are not in this list. "lagern" is taking a rest and includes laying down. You can also lay down for the purpose of watching animals, and you may need your sleeping bag for that and an umbrella or a tarp against dew or rain. Things are fine if you ask beforehand (though in German "wild zelten" has a very strong connotation of not asking). I tend to do that where it is obvious where to ask, and in countries where I speak enough of the language to ask with the help of hand and feet (but not enough to discuss if I'm caught). Emergency camping in alpine areas is called "biwakieren" and is allowed. I do not need to mention that there are areas where even "lagern" over night is forbidden (e.g. natural reserves). There you also won't be able to argue convincingly that you didn't see the signs. My experience is that if you stay friendly and don't leave rubbish things are OK and if someone finds you they'll usually wish you a nice tour. It is no criminal offense, so even if the police or a forest officer find you, they can fine you, but they don't have to. I've been "cought" by french gendarmes once on a hiking tour. However, when we asked where we should walk given that it was dark already we were allowed to stay over night but we had to put down the tent so the gendarmes would not need to get into discussions with the motorized crowd that had had the same idea of a nice spot for camping (and had attracted the police in the first place). (Though I know someone who was caught in a natural park outside the allowed places and had to write a "I'm-sorry-and-I-won't-do-it-again"-letter and someone else who was fined) However, if it comes to a discussion, my guess is that you'll have a very hard time to convince a forester that your tarp is really that different from a proper tent, and that you had to put it up because you were in an emergency (how come that night fell completely unexpected by a person who thinks so much in advance as to bring a tarp? And it is really hard to get properly lost in our small forests...). I guess the approach "Sure, we'll pack and leave immediately. Just where are we supposed to go now in the dark?" is far more promising. Not the answer you're looking for? Browse other questions tagged wild-camping europe legality germany or ask your own question. What are the basic considerations for hammock camping? Why should I take a pocket knife for wild camping / hiking?